Recently a client approached us that wanted a solution to handle loads that were in TMWSuite, but had zero charge amounts on them. The client did not want to allow orders to be dispatched or invoiced if there were no charges associated with the order. In order to facilitate these changes special development and process changes were implemented. TMW has functionality that allows a stored SQL procedure to run and make updates to the system during the save process of a movement. We at ASR used this functionality to change the dispatch status of the order if certain criteria exists. If an EDI tendered load, a copy of a master order, or a new order is created when the order was saved a SQL script looks at the order and determines if it meets the requirements or not. An “Available” status was restored on orders with a charge amount other than zero. The system was set to do nothing to the order. If the order had a charge of zero, the “Review” status was applied on those Zero Charge Orders, and the system would update the order changing the dispatch status to On Hold and the invoice status changed to Do Not Invoice. Once a rate was established, either from the rating engine or manually added to the order, and the order was saved, the SQL script reviews the order. If the charge was greater than zero the system will change the dispatch status back to “Available” and the invoice status back to Pending. We created a report to show orders that had been moved to the dispatch status of On Hold. This allows the clients’ personnel visibility of these loads, and can be utilized to track missing values. This report can also look for charges that don’t meet a standard threshold to ensure that charges to the customer meet the clients’ requirements. We also created a dispatch load board that looks for loads On Hold. 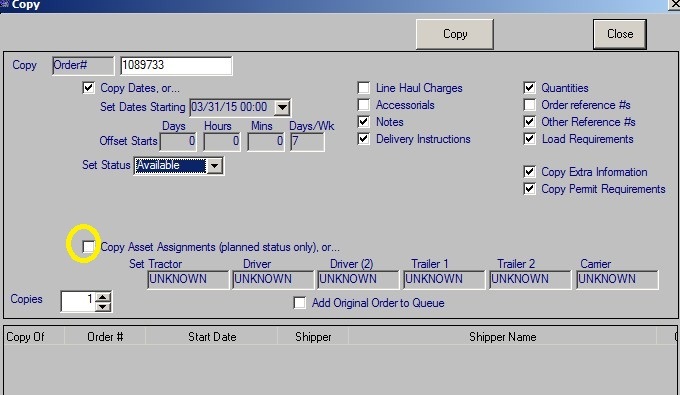 This board gives the operations staff visibility of any load that is on the books, but not available for dispatch. This board incorporated with the report makes it extremely hard to miss any load that has no charge. Any order that has a status of On Hold will appear on this board and once the orders status is no longer On Hold, it will no longer show on this dispatch board. During testing, it was discovered that there was a potential gap in the Zero Charge scripting that would allow users to copy an order that was not a Master Order, and copy existing planned resources to the new order. This caused an issue because the scripting intentionally only looked at “Available” orders, because if we change orders that have resources on them we will lose all resources when setting the status to “Review”. This is not an issue when making copies of Masters which is the typical process, but using existing orders can happen and we wanted to have a way to not allow this to affect the scripting. So we made some changes to the Copy Assets piece in TMW. First we used an INI setting to not allow users to copy any assets over from an existing order. Next, we used a group restriction to make the check box for copy assignments display only so the users can’t manually select this option.